WHAT: WHO WILL BUY MY OVERSIZED LOGS? Or: What Do the Chinese Do with the Wood We Ship Them? Millwood Timber purchases Douglas Fir & White Wood logs for export and specializes in OVER SIZE logs with no maximum diameter. Also welcome are shorts and lower grades. Scaling issues with these types of logs and how spangle, pitch ring, oversize knots, and konk are dealt with will be discussed in detail. His presentation will provide us with photos of the Millwood Timber yard, as well as the end product of most of the wood Millwood purchases and processes – coffins in China! WHERE: Thurston County Courthouse, Building 1, Room 150, 2000 Lakeridge Dr. SW, Olympia, WA. Note: For security reasons, the building is locked after business hours. The door into room 150 is to the left of the double door entry to the building. If the double doors are locked, knock on the door to the left of the double doors, and someone will open that door for you. However, please try to arrive before 7 p.m. to avoid disrupting the meeting and program. DIRECTIONS: Take exit for Cooper Point/Auto Mall Drive; follow signs to courthouse: Right on Evergreen Park Dr., Left onto Lakeridge Dr., Right into Court House and Parking area. Follow driveway to left. Building #1 is on Right side of complex, with parking area behind. May 2-4 WFFA Annual Meeting in Silverdale - Plan to attend! Our chapter is responsible for and will need help with Flyers, gifts, registration, auction, and vendors. The Washington State Department of Natural Resources (DNR) just created a new division: Forest Health. The definition of forest health isn’t straight forward and people don’t agree about what it is. The state definition for forest health is: the condition of a forest being sound in ecological function, sustainable, resilient, and resistant to insects, diseases, fire and other disturbance, and having the capacity to meet landowner objectives. Julie thinks that the State definition for forest health is more of an ideal, than a definition. Julie said that many landowners don’t manage their land, especially to prevent fires or to make their land more resilient to fire. In addition more people are moving in to areas where wildfire can occur. In addition forest health has been in decline for several decades in much of the Western United States, including Washington State. These are among the reasons the State has become more concerned about forest health. Each year the State publishes a booklet on forest health called “Forest Health Highlights in Washington.” The State has undertaken previous planning efforts issuing reports in forest health in 2004, 2009, 2012, and 2014. Its most recent effort is a 20-year Strategic Plan created in 2017. The DNR determined that to order to meet the intent of the legislature and to address the forest health issue in a meaningful way, it was necessary to take a broad view of and treat areas of state forest lands that have been identified by the department as being in poor health. Among other things, this has led to the hiring of additional state employees to address these problems. Over 30 diverse organization of have participated in developing the 20-Year Plan. Conduct 1.25 million acres of landscape-scale, cross boundary management and restoration treatment in priority watersheds. Reduce risk of uncharacteristic wildfire and other disturbances. Enhance economic development through forest restoration and management strategies that attract private sector investments. Plan and implement forest restoration and management treatments in a manner that integrates landowner objectives and responsibilities. Develop and implement a forest health resilience monitoring program. Julie said that there are over 200,000 small forest landowners in Washington. The State doesn’t want to tell them what to do, but rather help them move in the right direction. Forest treatments for the big commercial landowners run about $300 per acre. For small landowner that don’t have economies of scale it runs around $1,000 per acre. Eastern Washington is the primary concern because there are at least 2.7 million acres of unhealthy forestlands there. In Washington the 2010 Forest Action Plan identified the Chehalis Basin as an area where assistance was needed, and the area got both federal and state help. Julie asked about the concerns of those present at the meeting. Some of the answers were: regulation, bear damage, root rot, and drought. Julie talked about the prescribed fire program. It offers burn management certification for both commercial foresters and small forest landowners, both to create resiliency and to burn slash. She said that Hilary Franz, the State Commissioner of Public Lands supports the use of fire. However the State is finding it difficult to obtain foresters that have experience with it. Julie said that she is very supportive of urban forestry and explained that studies show that urban forests help produce lower crime rates, higher birth rates, and better mental health. More salmon and better learning were also mentioned by Julie or others. Julie concluded her presentation by offering to host a tour on her Soggy Bottom farm, which is 72 acres, with about 30 in trees and the rest in other types of agriculture. She has restored an area that previously was canary grass. She has also created shade around water ditches, and she has now had at least one large salmon come up one of the ditches. She has also been working to contain areas of root rot. Two foresters, Ryan Mansfield and Rick Kuykendall led the tour on this beautiful day. Ryan works with the Army DPW-Forestry to decide what area to cut. Rick works for the Army Corps of Engineers and arranges the contracts and administers the cutting. Joint Base Lewis-McCord is comprised of approximately 90,000 acres, but there are only two fish bearing streams. Much of the soil is glacial till. There are about 60,000 acres of timbered land, but only 53,000 acres are managed for timber sales. 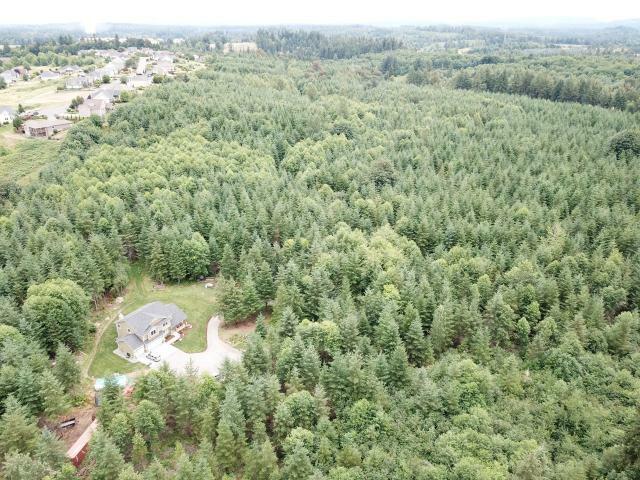 95% of the trees on the base are Douglas-fir. The base was created in 1917 when counties donated the land to the military for a base. If the base were closed, the land will be returned to the counties. Hunting with bows and guns is allowed on the base and that is supervised by the Morale Welfare and Recreation Department. Both deer and elk can be found on the base. There is also an active horseback riding club that utilizes the training areas. The base has 47 miles of fence, but most of the base is unfenced. Visitors are supposed to have a pass, but because most of the base is open, many people trespass. The open part of the base make for a goodly amount of trash dumping. Two weeks a year, during “Pride Week” the soldiers on the base clean up trash. The base has a trash cop, who works to stop the dumping. Most of the timber harvesting is thinning because the military likes the overhead cover, which can be important in the training of the soldiers, since it can conceal tactical movement from aircraft and satellites. The base has about 200 acres of old growth timber, but it is in the Artillery Impact Area so is metal contaminated from shrapnel and is not part of the harvest areas. Fires occasionally set off ammunition that is left out in the field. The soldiers are told to stay out of areas where timber is being harvested, but occasionally soldiers will walk by areas where tree are being fallen. Each year the base harvests about 8 million board feet of timber. This works out to about 800 to 1,000 acres a year that are mostly thinned. The average size of a cut tree is about 25 inches in diameter. On some timber sales we’ve had more than half the trees go out as poles. In recent years it has been difficult to find buyers for timber that is that large or larger. The forest land on the base is Forest Stewardship Council certified. The net profits are used on the base and some is shared with other bases that do not have timber. Finally the counties get 40% of the remaining profit monies. There needs to be a reset, since many of the trees on the base are getting big, because not enough are being harvested. There is a need to spray herbicides to kill Scotch broom, ivy, blackberries, and other brush. The base has a federally certified person that applies the herbicides. The base also burns areas on the base to control the brush. The White Horse area was the first parcel we examined. This was Training Area 15 within a 94 acre area that had been recently thinned, sprayed, and planted. 790,000 board feet of Douglas-fir was harvested. The thinning was not done from underneath but rather across the board (different sizes) with the goal of creating species diversity. The planted trees were tubed with two bamboo stakes and ties and were mostly cedar. Apparently the cost of planting each tree and putting on the vexar tube was around $5 which includes the contracting costs. The trees were individually marked for harvest according to very specific and detailed instructions, with one of the main goals being diversity. Most of the trees on the base are 80 to 100 years old. The harvested trees were all Douglas-fir. The harvests are done on a scale basis, not a lump sum. The scale cuts nearly always end up being within about 5% of what is expected. Each area on the base is typically thinned about once every 10 to 15 years. Patch cuts are done occasionally where there are pockets of root rot or a desire to create diversity. Tree morality seems to be increasing a bit because of the drought conditions of the last few summers. The bark beetle is also a likely cause of the higher morality. Natural regeneration does play a role in areas that are thinned, especially so because of the diversity goal. The second area we visited was the Oak Haven area, 53 acres with about 350,000 board feet of timber that will be harvested in a few months, with the object of releasing the small oaks that are common in the area. The Douglas-fir that are harvested will net the base about $600 to $650/MBF. Rick believes that the contractor harvesting the logs will get about $800/MBF, a small margin that would be unprofitable except that poles make up some of the logs and they can bring in as much as $1,200 per thousand. Feller-bunchers are sometimes used for harvests on the base. Rick said that they can often do trees as big as 32 inches by cutting from one side and then the other, and then pushing the tree over after making cuts. The base has a good relationship with the Nisqually Tribe. It has an archeologist on staff to help protect cultural and historical sites. Area three, our third stop, was Burn’s Woods, 170 acres from which 500,000 bd. ft. of timber was recently harvested. These were small patch cuts of about .5 acres that were intended to expand around regeneration areas. Each year about 4,000 acres of land on the base are mowed, but the effect is very temporary. Burning works better to control brush, especially on Scotch broom after the third burning rotation. The base follows state guidelines on burning, although it is not required to do so. In places the burning along the road works very well and flames die out when they reach the woods when conditions are right. The main concern with burning is to keep. Kent Jones of Resources Contractors LLC owns a 2 acre log yard near Onalaska that buys clear alder that can be sliced into veneer. About 90% of the veneer is exported, primarily to Russia, Germany, and Asia. Most of the veneer is used for cabinets and other high quality items. Kent is also the Southwest Washington procurement manager for a pole company in Bellingham that buys Douglas-fir and cedar for poles. He shared details on the specifications of the logs he buys and information about how they are processed. 50 people attended the annual Field Day at Ken and Bonnie Miller's and visited an adjacent piece of property that the Miller's have recently purchased and are trying to plant. Is it a FOOL’S ERRAND or MISSION IMPOSSIBLE? Ken used a plow to create some raised areas for planting in a typically wet area and has planted a variety of species. Western white pine seems to be doing well. He has planted western red cedar and has it protected from deer browse with Vexar. John Henrikson presented American Tree Farm System's “My Land Plan”, a free online tool, which can be accessed at www.MyLandPlan.org. 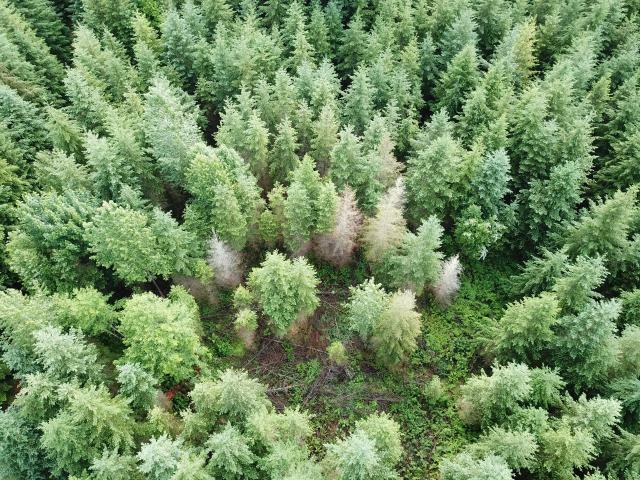 ATFS encourages tree farmers to use this tool to help develop their management plans, but it stops short of being a fully-featured plan that is generally required for certification and cost-share programs. The most useful features are its maps and activity logs. John has used My Land Plan, which draws on Google Maps, to create electronic maps of the boundaries, roads, trails, and features on his Naselle tree farm. He also described 2 other software programs of potential interest to members: GaiaGPS and ArcGIS. Mike Warjone of Port Blakely gave a presentation titled "Cross Laminated Timber and The Future of Commercial Wood Construction." He gave a similar talk at the Lewis County Farm Forestry Association meeting in April 2017 and a video of his 29 minute presentation can be viewed here. Mike believes that more commercial buildings in the future will be built out of wood and fewer from steel because energy is becoming more expensive and it costs much less to build structures from wood than from steel or concrete. Prefabrication construction techniques can be used offsite with CLT wood buildings which means the building can be constructed faster by putting pieces together on site with less negative impact and disruption to the community and also at a lower cost. It is critical to have first year weed control with new seedlings. Early weed control resulted in twice the volume for a 23 year-old plantation verses an untreated area. Weed control results in greater root vigor in early stage seedling growth which also minimizes long term deer browse damage. For best results you need to take out grass and not just the overtopping alder trees in a Doug Fir plantation. There really is no benefit to the young seedling if you do not take out the grass. Broadcast spraying when the trees are dormant is the most effective treatment technique. If you need to spot spray, treating an area at least 3 to 4 feet in diameter is best. Data very clearly shows that preventing weeds early on leads to bigger trees. Our membership drive continues. You are all encouraged to approach at least one person for membership. Our chapter will give a $25 rebate to new members for the first year. Membership Special for 1st time new members: $45 for 1 year, 1 chapter. WFFA does a lot more than have meetings. Maintaining favorable conditions, regulations, and attitudes regarding land ownership requires member participation and vigilance.Contact President Justin Becker: [email protected] or 360-789-8449 or Treasurer Bonnie Miller: 360-705-1888. South Sound chapter typically meets the 2nd Wednesday of each month except November and December. -- January through April and October are educational meetings held in Olympia, usually at the Thurston County Courthouse. FOOD is provided at 6:30 p.m., Business meeting at 7:00 p.m., followed immediately by program. -- May through September are field tours at various locations, usually starting at 6:30 p.m.
Becker drone image July 2018. Many forestry influences seen including conversion pressure, riparian buffer area, hardwood pockets, maple tree dead zones, fire (takes a sharp eye). 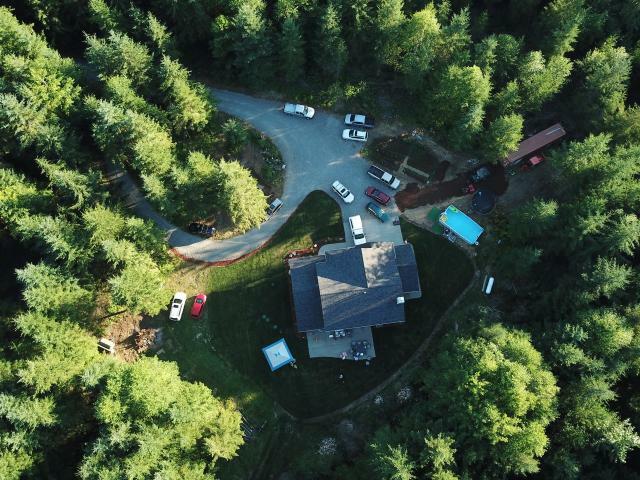 Becker drone image July 2018. Possible root rot pocket discovered by using drone. Becker drone image July 2018. Tour group can be seen in back yard / patio area.